I don’t think i’ve ever met anyone that doesn’t eat cookies. It’s just impossible. I mean, there are cartoon characters inspired from the love of cookies, songs even. Who hasn’t grown up singing and accusing everyone of stealing cookies from the cookie jar? (who me? yes you. couldn’t be. then who?!) SO anyways, it’s really important to have a basic cookie recipe written down somewhere, in case of emergencies, like when you’re craving cookies. And some of you might think store bought chocolate chip cookies are the answer, but they’re not. There’s no going back once you start making your own cookies. You can’t throw away that sense of accomplishment, or the fact that you can add any flavor possible to them. My favorites are peanut butter, nutella, oatmeal, walnuts, tons and tons of chocolate chips, and the list can really go on. The next thing on my baking agenda is trying to make banana nut cookies. but that’s after I come back from Paris (Yes I finally get to go to the land of croissants and macaroons!) wanting to bake everything I’ll have stuffed my face with there. Just like with brownies, there are a few things you have to make sure you’re doing right when you make cookies. Never use an electric hand mixer. Always use a wooden spoon. Yes, a wooden spoon. It really helps make a good base for the cookie when you mix the butter and sugar together. Also, if you want that perfect crumb, use brown sugar. 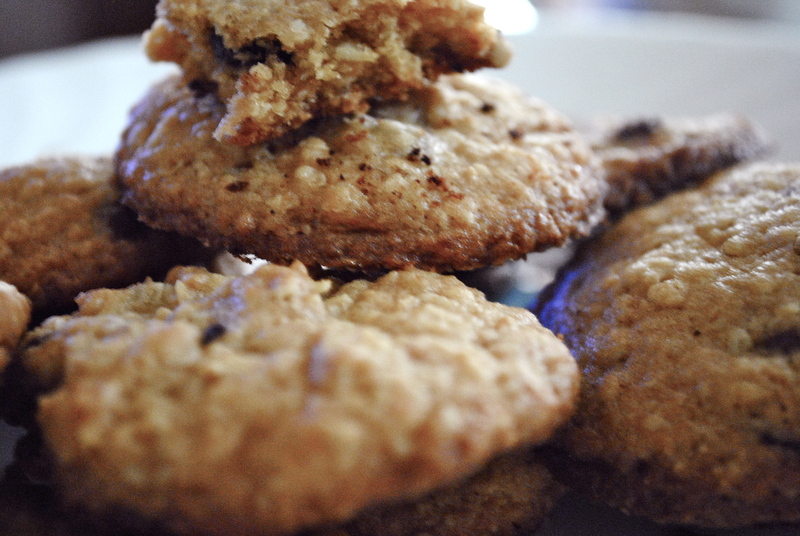 White sugar won’t change the taste too much, but the texture will be solid and dry, and no one likes a dried out cookie. Also, never use melted butter. Even if you’re in a hurry, just defrost the butter in the microwave for 10-15 seconds, or more if you’re butter is frozen, but never pop it in the microwave and heat it. It’s just like with brownies, except the opposite, actually. For a good brownie, you need melted butter. But for a good cookie, you need room temperature butter. Also, when it comes to cookies, your oven has to be preheated. I sometimes put a cake in before the oven is preheated, and it doesn’t make much of a difference, even with brownies, but for a cookie you have to. The reason is because the baking time is only 8-10 minutes. If you don’t preheat your oven, it could make the cookies too thin, they could burn at the edges, or they could just turn into one big cookie, and you’ll end up with plate of broken up cookie pieces. So preheat your oven. Also, some people have trouble with the thickness of their cookies. If you want a big cookie that stay chewy and has the perfect crumb, make sure you add enough flour. The stiffer the cookie dough, the thicker the cookies will be. So here’s a basic cookie recipe that you can basically add anything to. Oh and one more thing, if you’re making a big batch of cookies, you obviously can’t bake them all at once. In between batches make sure you let the cookie sheet cool down completely before you put more cookie dough on it. If you don’t you’ll end up with cookies that look perfect on top, but they’ll be burnt on the bottom. This has pretty straightforward ingredients. Start off by mixing the butter and the sugar. Keep mixing till it’s fluffy and light in color. Add in the egg. Don’t over mix, because there’s baking powder in this recipe as well, and you don’t want cookies that rise up like bread. Once the egg is mixed in add the salt, nutmeg, cinnamon and baking powder. You don’t have to add the cinnamon or nutmeg, or you can just add one of them, depending on what you have at home. You can just add 1/2 tsp of vanilla essence instead. Their flavor is very subtle, but the cookies smell and taste delicious with it! 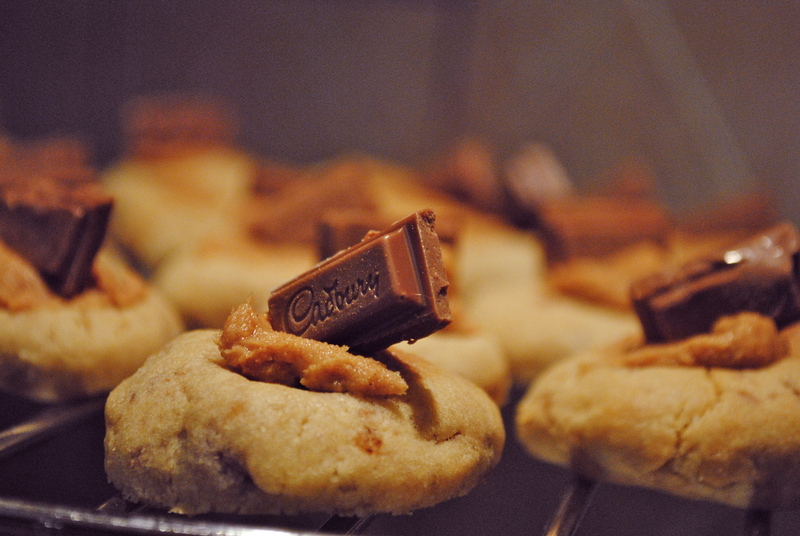 Fold in the flour and the chocolate chips. At this point you can add any other flavor or ingredient you want. 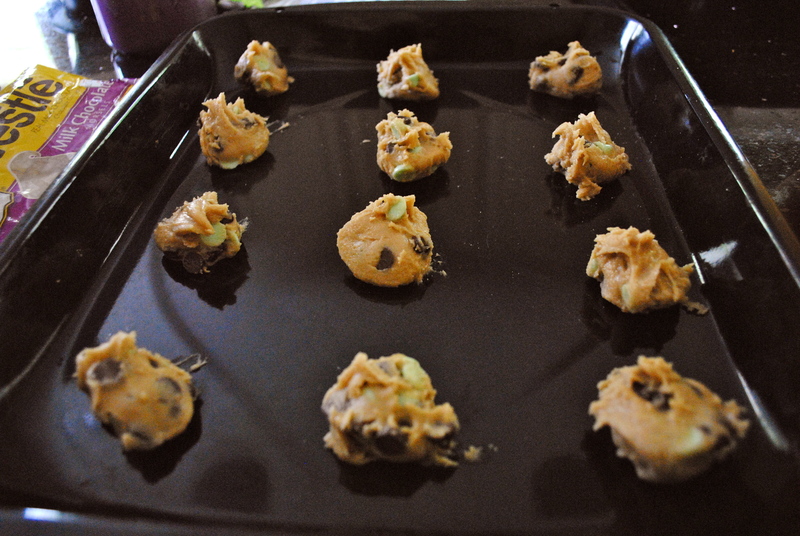 Then just drop tablespoons full of cookie dough onto your baking sheet and bake them for about 8-10 minutes, or till the edges turn golden brown. 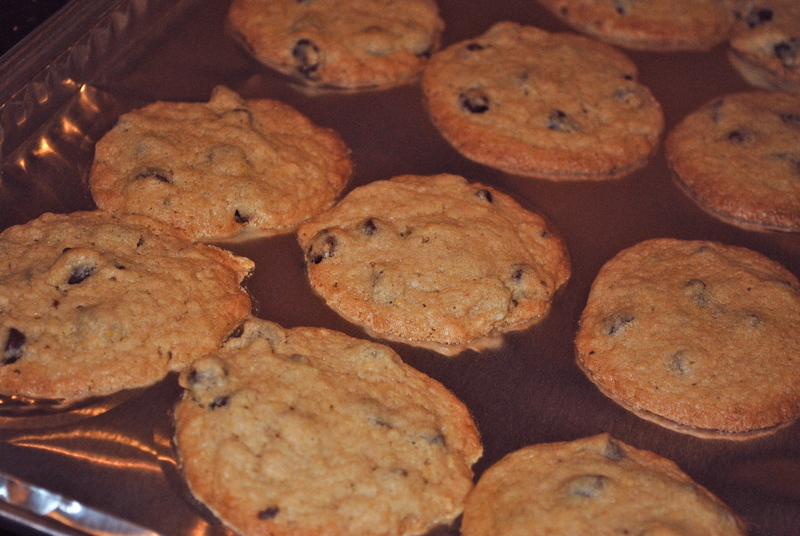 Take the cookies out then, and let them cool down a bit on the baking sheet. They’ll continue to cook a little, so don’t worry if the centers aren’t fully cooked when the edges turn brown, just take them out or they’ll burn! 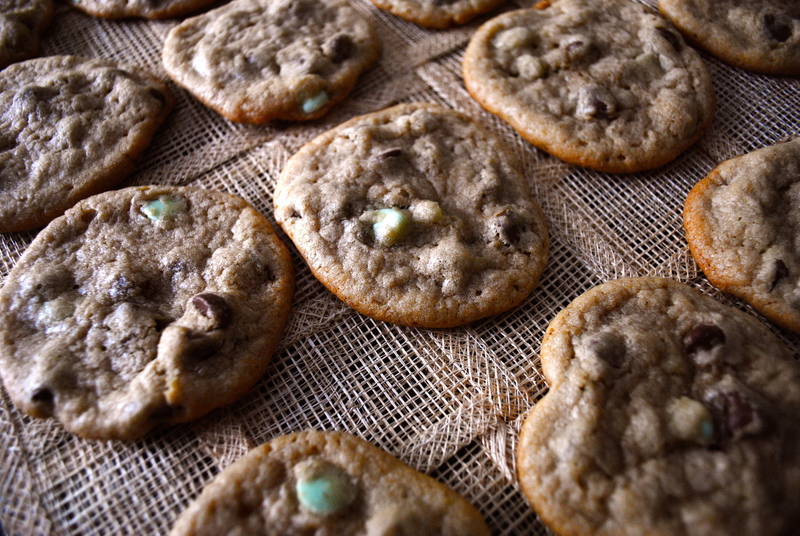 This recipe makes one dozen large cookies. You can make smaller ones if you want too, but they’ll finish just as quickly!